Triple Room 25 sq. ;Connecting RoomsApartment 38 sq.Apartment 46 sq. Our 25 sq. Triple Rooms are equipped with 1 large bed or 2 twin beds, with 1 extra single bed. They can accommodate up to 3 persons and are located from the 1st to the 6th floor. They are equipped with 2 twin beds which can be prepared as a large bed of 180 cm. Upon reservation, please notify the exact number of guests (adults and/or children) and your bedding preference. We will do our best to accommodate your request. 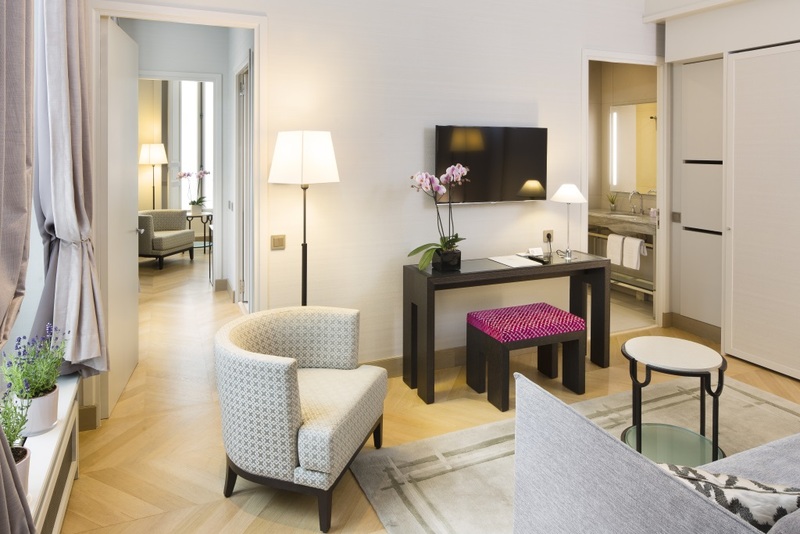 For more space and comfort, do not hesitate to check our Deluxe Rooms and Apartments. Equipment: air conditioning, heating, hair-dryer, mini-bar, safe-deposit-box, free internet Wi-Fi (via optic fiber), satellite television and radio. Complimentary baby cot available upon request. Perfect for families, each Connecting Rooms (min. 41sq.) have their own bathroom. They can accommodate up to 4 persons and are located from the 1st to the 6th floor. - 2 rooms with 2 twin beds. Upon reservation, please notify the exact number of guests (adults and/or children) and your bedding preference. We will do our best to accommodate your request. - 2 Connecting Rooms for a maximum of 5 persons. - 3 Connecting Rooms for a maximum of 8 persons. 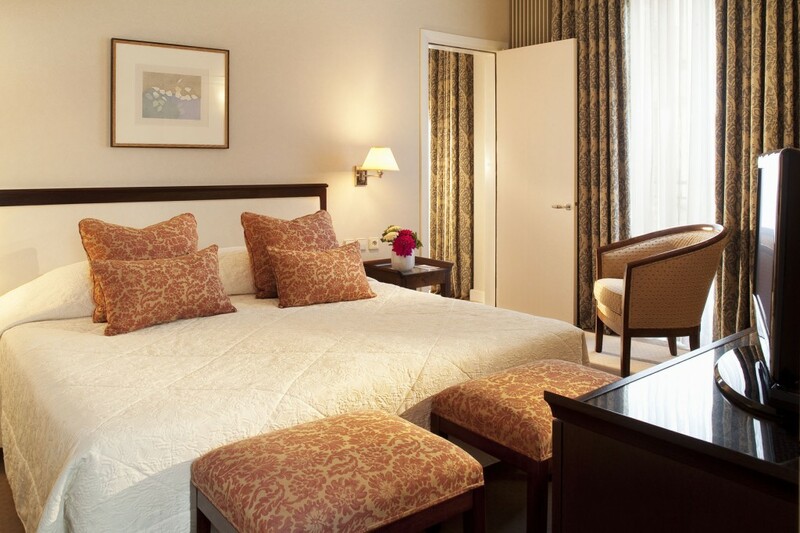 - 4 Connecting Rooms for a maximum of 10 persons. Equipment: air conditioning, heating, hair-dryer, mini-bar, safe-deposit-box, free internet Wi-Fi (via optic fiber), satellite television and radio, telephone. Complimentary baby cot available upon request. Our 38 sq. Apartments are located from the 1st to the 5th floor, overlooking rue Pasquier and our beautiful garden. - 1 bathroom with a bathtub. Some Apartments are also equipped with a shower or a bidet. Upon reservation, please notify the exact number of guests (adults and/or children) and if you prefer a shower. We will do our best to accommodate your request. Renovated in 2016, our 46 sq. Apartments are located from the 1st to the 4th floor, overlooking rue Pasquier and our beautiful garden. They are composed of a living-room, a separated bedroom and 2 bathrooms (one with a shower, the other one with a bathtub). The entrance of the Apartment gives access to a living-room (where 2 extra single beds can be added) and a bathroom with a shower. A corridor leads to the bathroom with a bathtub and the bedroom, equipped with 2 twin beds which can be prepared as a large bed of 180 cm. Equipment: air conditioning, heating, bathtub, separate shower, towel heater, toilet with small shower, hair-dryer, mini-bar, safe-deposit-box, free internet Wi-Fi (via optic fiber), satellite television and radio, telephone.